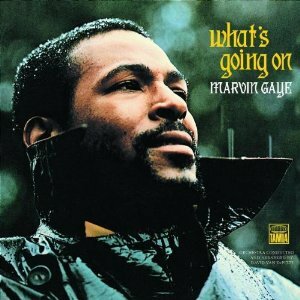 Forty years ago Marvin Gaye's politically charged album What's Going On (and no, that isn't a question - Marvin is telling us in fact what IS going on) debuted. His label Motown/Tamla was convinced it was doomed to fail because of its unsavory themes but Americans felt otherwise about this concept album. It resonated with a country who like Marvin had strong feelings and frustrations with the Vietnam War, police brutality, drug abuse, racism, and environmental concerns to name just a few key issues plaguing the country. Sales were so tremendous that is rested on on the Billboard charts for more than a years time, selling over 2 million copies in just a year and a half. Over the last 4 decades nearly every mainstream music media outlet has voted What's Going On one of the greatest albums of all time and one of the most important political soul records to come out of America, ever. Motown has recently announced that an extra special reissue of What's Going On is in the works so it seemed to be the prefect time to revisit this record on air. Tonight from 7PM to 9M I will focus on this WGO, looking at the building blocks to what Marvin used to make this record, the songs from this classic record (as well as the artists who have covered them), and a handful of the thousands of artists who have either re-recorded versions of his music or been wildly influenced by his creative output. What I didn't realize while working on this show is just how many legendary politically infused soul records were released in 1971 so while the primary focus tonight is Marvin Gaye, the secondary focus is a 101 look into soul music from the late '60s to the mid '70s that carried a groove and a heavy message. Tune in tonight to WRIR, 97.3 on your FM dial if you are a RVA local or stream it live at www.wrir.org.